Get your message in front of hundreds of people every week of the FootballSSG season and thousands of people in the lead up to the season. Any games highlighted in green font are to be rescheduled. Have you started planning your team for the next Summer Months competition? 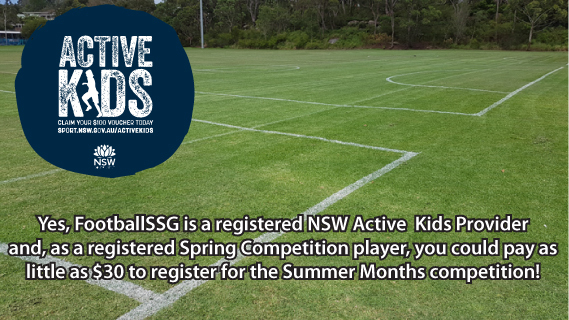 We’re playing again at David Thomas Reserve, Manly Vale, on Monday afternoons and evenings starting the end of January. You’ll be keen as mustard to get back on the field after a couple of months away from the game ... but don’t leave the organising too late (end of school, Christmas, New Year and the school holidays will all get in your way, so if you don’t get yourself organised soon you may not be able to get it organised at all). Registrations are open now ... click here for more information.